PAST – April 2013 (Apr 28, 2013) Celebrate the Horse!! Past -April 2014 (Apr 27 2014) CELEBRATE THE HORSE! VENDOR FAIR & ADOPTION CLINIC! Past event-Bottle Drive….NOW until April 2013! Past Event: 08-28 thru 09-03-2012: Fonda Fair Booth! Come join us! Marco – ADOPTED JULY 2014! Volunteers Are Always Needed! 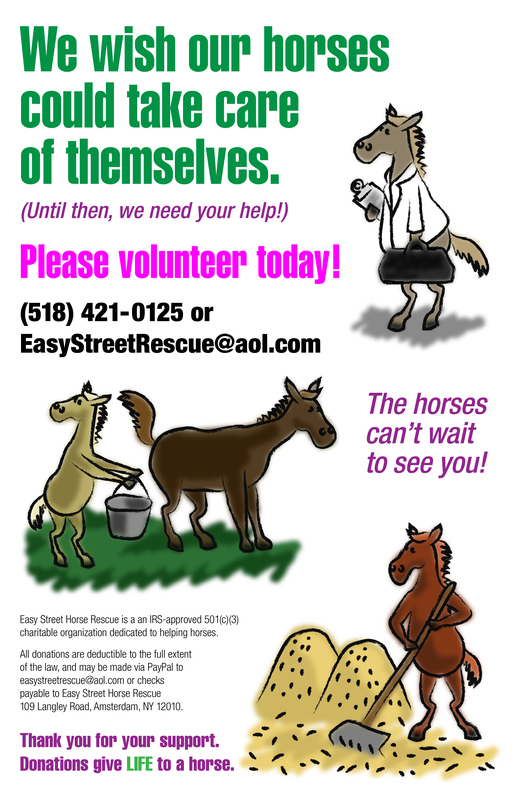 Most opportunities have a committee but a few areas are directly assisting the Director of Easy Street Horse Rescue. Maintenance Volunteers who have an interest or skills in handy/maintenance work. Mowing, gardening/landscaping, repairs, building/construction, painting, fencing etc., are the projects lead and accomplished by this committee. Horse Rehab Horses are much better able to thrive in the company of humans when they have spent quality time with people who understand them and know how to help them reach their potential. You can enjoy a wonderful feeling of satisfaction by becoming part of this team. Adoption/Foster - These volunteers inspect potential adopters’ facilities, and check references on applications. Training is available and volunteers must be over the age of 18, use a computer, able to drive and have a digital camera. They will also create posters on adoptable/foster horses and distribute them to appropriate markets. Events – This volunteer will assist in planning and organizing events and fundraisers. Special Event- These volunteers help on the various events during the year such as our annual Open House in May, Garage Sale in August, County Fair in Aug/Sep, and “Run for the Horses” in October. These volunteers do not plan the events, but they staff them on the day of the event.. Emergency Response - This team assists with impoundments and horse emergency response. Training is available for qualified individuals. Some volunteers must have horse experience, others are responsible for manning a hot line to members on the team when an emergency horse rescue occurs. Please email Nina your desire to be on this committee to easystreetrescue@aol.com Be sure to include your phone number, indicate your ability with horses and if you have a horse trailer or able to borrow one.